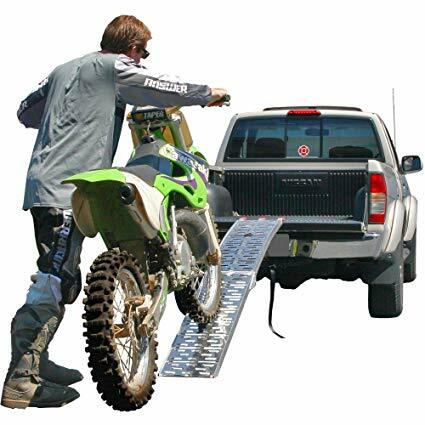 Your Dirt Bike loading ramp is one piece of equipment you simply can’t do without. 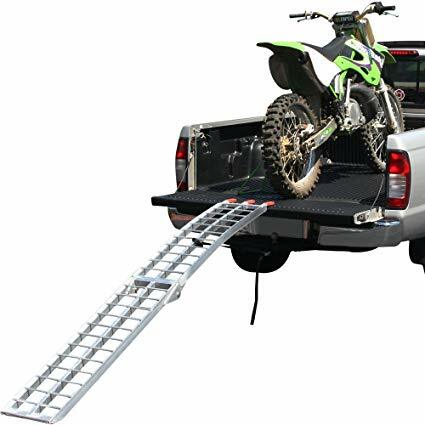 Getting your dirt bike onto the back of a truck or trailer is pretty difficult without a strong loading ramp that can support the weight of your bike. Most of the motorcycle loading ramps available are made of aluminum, which is strong and light, so it’s easy to lift them into place. Corrosion isn’t a problem either with aluminum. In my 30 odd years of loading and unloading dirt bikes of all sizes, I’ve used everything from an old plank of wood to the aluminum folding ramps as reviewed here. The big advantage of the folding motorcycle ramp is easy storage. They take up less room in your vehicle, and in your garage. The most popular makes are Titan, Black Widow & Pit Posse. They have a proven track record of producing quality, durable ramps. 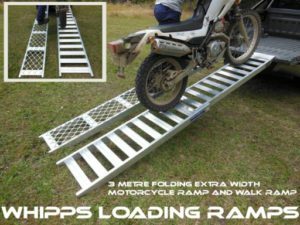 When choosing a dirt bike loading ramp, there are some things you need to consider. Obviously, it will also depend on the type of bike you are loading, and your vehicle tray height. 1. The length of the ramp. They generally range from 7.5′ to 10′. The longer the ramp, the less the incline, so the easier it is to wheel your bike up the ramp. 2. The load capacity of the ramp. They generally range from about 600 pounds (273 kg) up to 1500 pounds (680 kg) for the larger street bike ramps. Your average full-size dirt bike weighs between 240 pounds (110 kg) up to about 370 pounds (170kg), so there’s a large safety factor built in there with the capacity of the ramp. 3. The width of the ramp. Obviously the wider the better. There is less chance of the bike coming off, and less chance of the ramp twisting and rotating if the bike goes off center. 11″ (280mm) is a pretty common width, anything narrower is getting a bit tricky for loading, and anything wider is a bonus. The spacing of the crossbars: Closer together is better. Some are serrated for better grip. The flat plate design usually has holes or grooves to give some traction, but it’s hard to say which is more rigid. Rubber coated attaching points: This is a nice feature to prevent scratching the tray of your vehicle, and help prevent the ramp slipping, which is the last thing you want when the bike is halfway up the ramp. A good safety feature. Arch design: The upper section of the ramp is curved slightly to help smoothen the transition when loading your bike, and increase the clearance under the bike. Tie-down strap: A good safety measure to keep the ramp in place while wheeling your bike up. When only the best motorcycle ramp will do: The Titan 10′ HD Wide Motorcycle Loading Ramp. More details below. There are heaps of reviews on Amazon about all of these ramps and almost all are overwhelmingly positive. If you want to see what other customers are saying about them, click the links below each one. The Black Widow AFL-9012 is my pick for ‘value for money’. Black Widow is one of the leaders in motorcycle loading ramps. 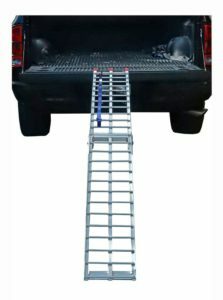 They have a wide range of ramps for all load capacities and budgets. This ramp has all the features you are looking for. At under $100, it is certainly ‘bang for your buck’. I’ve included this ramp even though it is not just a dirt bike ramp, this ramp will handle the heaviest street cruiser you can find. With 4 beam construction and 1500 pound load capacity, you never have to worry about the ramp withstanding the weight of your bike. Length: At 10 feet the extra length makes the incline shallower and easier to wheel your bike up. Important if you’re loading something like a Harley Davidson. Width: At 17.25″ you don’t have to worry about coming off the ramp, you can even ride your bike up this ramp. Buy 2 and load your Quad or ATV. Sure, it’s more expensive than the lighter weight ramps in this review, but when you want the best of the best, this is it. The Pit Posse PP2755 is another loading ramp from a well-known and respected manufacturer. 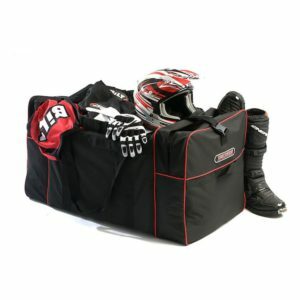 Pit Posse has a track record of 15 years of producing quality motorcycle equipment. 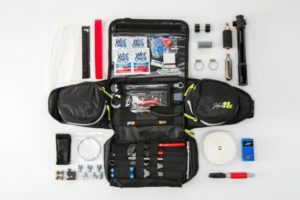 As with all Pit Posse products, you get a 5-year manufacturers warranty, which is a huge bonus, given that dirt bike ramps get a pretty hard life. It’s hard to find fault with this ramp, the rubber attaching points and the tie-down strap are 2 safety features important for keeping the ramp in place when wheeling your bike up. 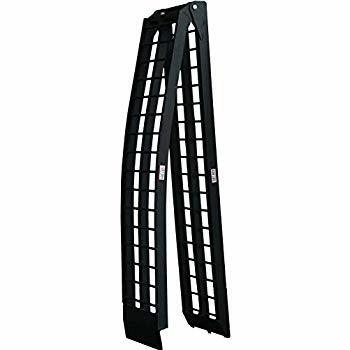 The Yaheetech is another 7.5 foot/750 pound ramp which has all the features: the rubber attaching points and the tie-down strap important to safely loading your bike. It doesn’t have the brand name profile of the Pit Posse or Black Widow, but is the cheapest ramp in this review, and has a very similar build quality. The flat plate style design of this ramp makes wheeling the bike up a little smoother, as you’re not running over ladder-type rungs. Another advantage of this design is that some people buy two of them, and use one ramp to walk on while wheeling the bike on the other. The plate design is a lot easier to walk on than the rung type. This makes loading the bike a whole lot easier if your tray is extra high, as a lot are these days. The biggest plus for this ramp is the 10-foot length. It just makes wheeling your bike up that little bit easier. Being a Titan, you know the build quality is there. The only downside is the 600-pound capacity, but this may not be a problem for you, depending on your bike. It’s still sturdy enough for a large dirt bike. If you have a heavy street cruiser, you would be pushing it, but that is not what this ramp is designed for. Comes with the tie-down strap to keep it in place. Measurements: 10’Long x 11.25″ Wide. 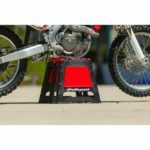 There is a good selection of dirt bike loading ramps in the under $100 price range that are very similar. The Black Widow AFL-9012, Black Widow AFP-9012, Pit Posse PP2755, and the Yaheetech are all within $17 of each other. The only standout difference between these four being the flat plate design of the Black Widow AFP-9012. Some may prefer the crossbar rung type design, but you can’t really say which is more rigid, the difference is so slight. They all have the basic essentials you look for in a ramp, plus a few extras. Best Bang Value For Money: The Black Widow AFL-9012. It’s not the cheapest but has everything you are looking for in a dirt bike loading ramp, and has heaps of 5-star reviews. The Titan Ramps are hard to beat. In the lighter range, the Titan Ramps 10ft Aluminium Loading Ramp (120-SS) has everything you are looking for. The 10′ length is the bonus, making the ramp incline lower, therefore easier to push the bike up. The tradeoff is the lower capacity of 600 pounds, I assume because of the longer length, the leverage is greater, so capacity is lower. Best Outright: The Titan 10′ HD Wide 4-Beam Truck Loading Ramp. When the load capacity is important because you may need to load a bike much heavier than a dirt bike, or you just want the most durable ramp available. With a load capacity of 1,500 pounds, the 4 beam construction means the extra stress of the 10-foot length is not an issue. Some people have purchased 2 of them and used them to load quads, ATVs, garden tractors, lawn mowers or farm equipment. None of these ramps ship to Australia!? 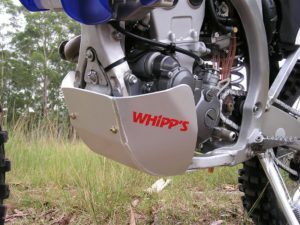 If you are looking for the best motorcycle ramp made by a well-known and respected Australian company, you can’t beat Whipps. Is there a motorcycle loading ramp that has served you well that you can recommend? Please feel free to share your thoughts below. Very thorough reviews on many different loading ramps and the pros and cons of each. If you can’t decide on one here on your site, you obviously don’t need one! Thanks for sharing. Hi Terry. Thanks for your comments. 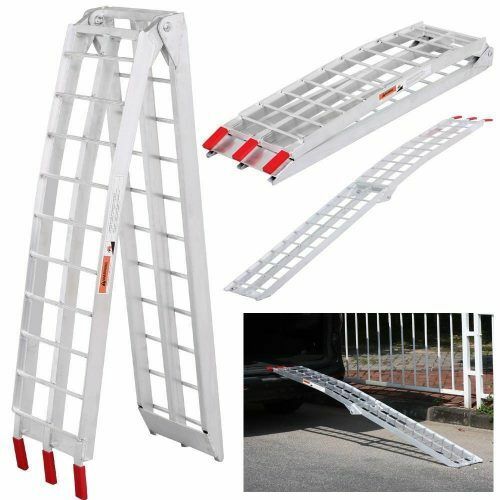 There’s a huge range of folding aluminum loading ramps available these days, something for everyone’s needs. I’ve covered a wide range here to make choosing easier. I can see how a ramp would certainly help get the bike on the truck. Your reviews are really well written. Not much left out. 1) Can you ride the bike up the ramp or is it advisable to push it up? 2) If you are alone and the bike is heavy, would you recommend a 2nd ramp for you to walk up as you push the bike up? 3) I am guessing it would be pretty disastrous for a bike to fall off a ramp, are there any safety features to prevent that ever happening? Thanks a lot and a great article. Hi Tim. Thanks for your comments. 1. The only ramp I’d be game riding the bike up is the Titan 10′ HD 1500 lb ramp because of its extra width of 17.25″. 2. Yes a second ramp is commonly purchased for this reason. A good one for this is the Black Widow AFP-9012 because of its smooth flat plate design, as opposed to the rung type crossbars. It’s easier to walk on. 3.The best safety features to prevent a fall are the tie-down strap and rubber attaching feet which prevent the ramp sliding sideways while wheeling the bike up. Most of these ramps have those features. To prevent the bike coming off, its always good to have someone on the other side to help you. my friend is a true dirt bike die-hard fan and recently I have tried driving one of these things for the first time in my life and I have to say- I was absolutely blown away! We went outside of the city where there is a dedicated track for dirt bikes and also some cool offroad little roads! However, one of the issues we had with our exprience is loading the bike itself into trailer and we used some homemade loading ramp which honestly, was hustle to use and was quire unreliable. This article came just in time as my friend is searching for some legit loading ramps for future trips. I truly appreciate these short, but very informative descriptions to each loading ramp. I found them to be very helpful! So far the best one in my eyes has to be Titan 10′ HD Wide 4-Beam Truck Loading Ramp 1500 lb, due to its long ramp, enormous weight capacity, great build quality as well as the presence of safety straps and more. Overall, seem like a great package! Thanks for an amazing article, keep up the great work! Hi Evald. Yes I agree, the Titan 10′ HD 1500 lb is an excellent ramp which is strong enough to handle even the heaviest bikes. If your friend is looking to buy a ramp you could send him a link to this post, and it will help him decide. It will make life easier for him. I’ve used the home made plank of wood years ago and it is a hassle, you’re right about that. If I can be of any help, please just let me know. Visited your site and you did a very thorough review of many different loading ramps. Your site flows well too. Great job and keep up the good work. I would have to say, if I were looking for a loading ramp, I’m sure I could definitely find it on your site and make a purchase. Thanks. Hi Terry. Thanks for your comments. I’ve tried to cover all bases with this review, there are so many to choose from. It makes it easier to decide when someone has done the ground work for you. Brilliant post ! as you can tell I’m a girl and I don’t know anything about these things but my brother bought a new bike and he doesn’t use anything to load it to the truck as you can tell is very heavy that he needs a second hand that’s why I think these ramps are very useful. Hi Mariem. If your brother has just bought a new bike and doesn’t use a ramp to get it onto the truck, then a loading ramp will certainly make life easier for him. He won’t need someone to give him a hand lifting, the ramps make it easy. Any of these would be suitable, it just depends on the size bike he has, and your budget. Thanks for your comments, if there is anything I can help you with, just let me know. 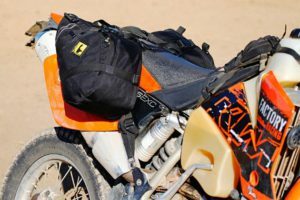 You most certainly have covered a number of Dirt Bike Loading Ramps in your review and it made for a very informative and interesting reading for me. It’s amazing what technology has done for making loading ramps a whole lot lighter and easily transportable. My guess is that the wooden ramps you used in earlier times must have been quite heavy if they were to be able to carry the weight of the dirt bike whilst loading it onto another vehicle or trailer. So the options of a lighter and probably stronger material make this task a lot easier to perform. Thank you for the extensive effort you went to to provide even Pros and Cons on each ramp. This is very valuable in determining which one is best. Yes things have come a long way in recent years with the wide range of lightweight folding aluminum ramps available today.